Carol Nelson, LM, CPM, a midwife at The Farm, was an LPN when she started attending births in 1971. She became a Florida Licensed Midwife in 1982, and in 1995 also earned the CPM credential. 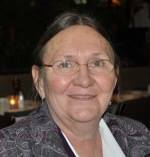 Carol was a co-founder and instructor at the South Florida School of Midwifery. She wrote and lobbied for the Tennessee CPM law that was passed in 2000. The law established the Council of Certified Professional Midwifery of Tennessee, on which Carol sits. Currently Carol is the Midwifery Education and Advocacy Co-coordinator for MANA and also the Director of the Applications Department for NARM. Carol is also a devoted social and environmental activist. She serves on the Board of Directors of Plenty International, a non-profit organization started on The Farm to promote local food and water, energy, self sufficiency, and to provide disaster relief to communities in the US, Central America, and Africa. Carol is a founder of the Swan Conservation Trust, another nonprofit that protects and restores forests, waterways, and natural habitats in Tennessee. She is a mother to three daughters, all born at home. To learn more about Carol Nelson or her projects visit thefarmmidwives.org, http://swantrust.org/index.html, or http://plenty.org/.